Forklift Tires at Pete’s Tire Barns. We have one of New England’s largest inventory of Forklift tires from top brands like Carlisle, BKT, Michelin, Trelleborg, Solideal, and Watts. We offer a wide variety of sizes for both Pneumatic and Press on tires. With one of New England’s largest tire inventories we can find the tire to fit your forklift. Pete’s Tire Barns also offer on site forklift service with our mobile press truck. 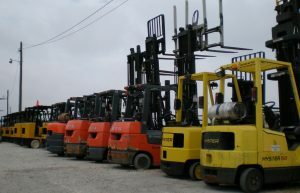 This allows us to come right to your site and service all of your forklift tire needs. Our forklift truck tires will fit most forklifts, including Nissan, TCM, Caterpillar, Hyster, Komatsu, Bobcat, Mitsubishi, John Deere, Taylor, Yale, Mustang, Crown, Clark and many other brands of material handling equipment.